If, if, if. Life is full of them. Counterfactuals. What might have been. How things just might have turned out differently had x, y or z not, or had, happened. And F1 is especially laden with this sort of thing, as is befitting a sport where the distinction between success and failure has a particularly knife-edge quality. To coin the saying, 'F1' is 'if' spelled backwards. And while we're on the subject of the things that lay alongside actuality, imagine that you could select any two technical brains for your very own F1 'dream team'. Ross Brawn and Adrian Newey are the two that many of us would pick. And why not? They've been (with Rory Byrne) F1's technical stars on the modern age, with only four on the last 21 constructors' champions' cars not having involvement from one or other of them. But while their being brought together to produce a car sounds strictly like it is from the realms of fantasy, it actually very nearly happened, before the plug was unceremoniously pulled on the squad they were part of. The team in question is Haas Lola, the team that ever so fleetingly was F1's next big thing. 'Who?' you might be forgiven was asking, as while both the Haas and Lola names are famous in motorsport more widely neither is central in F1 folklore. But in 1985 it was a team apparently poised to have the same impact on F1 as a bowling ball has on a set of pins. In the event however the team lasted but a single full season, 1986, and in that its cars were usually nowhere near the front. Six points were won via attrition, but that was its lot. Of course, F1's not exactly short of teams arriving amid much fanfare only for it all to fizzle out when it meets the cold wind of bracing on-track reality. One can think of March, BAR, Caterham/Lotus and others, and thus Haas Lola seems just one example on a rather lengthy and inauspicious list (indeed, some wags later quipped that BAR stood for 'Beatrice Again Racing', in homage to the Haas Lola's chief sponsor). Yet such apparent potential at Team Haas, as the team was otherwise known, being squandered is worthy of its own investigation of what exactly went wrong. As is often so in such cases, it all commenced with considerable promise. The story starts with the imposing cigar-chomping figure of Carl Haas, an American motorsport impresario with an impressive record of success in that country's series, particularly CART/Indycar. In 1984 he struck a deal with Beatrice - a huge food company - to sponsor his Indycar team, and as part of the deal Beatrice would bankroll an ambitious F1 effort by Haas too. From here gradually Haas put all of the requisite pieces in place: he got Teddy Mayer and Tyler Alexander, ex of McLaren's 1970s rise (and partial fall), in to manage the effort, a factory was purchased near Heathrow airport and an impressive facility was established there, a company titled 'FORCE' (Formula One Race Car Engineering) was set up, and then a head hunting strategy that lacked nothing in ambition was set in train (as an aside, Lola despite featuring in the team's name was not involved in the project directly, instead it reflected that Haas was the company's US distributor, and thus he thought it would be useful to associate the Lola name with the team). Best of all it seemed Haas had a major coup in his engine deal. He started at the top, seeking to persuade champion McLaren's supplier TAG to sell him engines, though that was shot down in flames by Ron Dennis who for obvious reasons wanted to keep those units for his team's exclusive use. But by this time Ford Cosworth, whose legendary DFV had won no fewer than 155 races up until 1983, was finally working to join the turbo game by developing its own V6, and it was Haas who was able to strike a deal with the Blue Oval, and an exclusive one, for three years. With all of the jigsaw pieces now in house it seemed little could stop Team Haas as it made its F1 debut in late in 1985 preparing for a full tilt in 1986, and indeed even in ultra-cynical F1 its joining the front runners was considered a matter of when rather than if. Here's what Autocourse had to say of the team at the end of 1985: 'Once the new Ford engine is tied to the British-built design it has to succeed'. 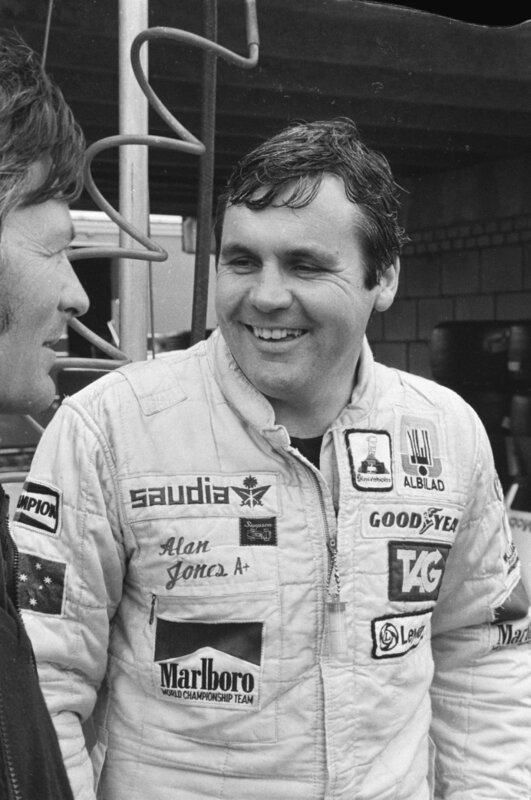 While in the same journal Maurice Hamilton noted that 'with such a wealth of experience spreading from the management team to an accomplished band of mechanics, the thought of Alan Jones getting his hands on a Ford-Cosworth turbo must worry other teams'. But even at this fledgling point of the team's existence the seeds of its eventual downfall were beginning to take root. For one thing, in July 1985 there was a change at the top of the Beatrice company with its Chairman, racing enthusiast James Dutt, rounded on by Directors and forcibly replaced with William Granger, who did not hold his predecessor's racing passion. As a result even in late 1985 rumours started to swirl that Beatrice was withdrawing its bounty from the Team Haas effort, something that was confirmed by early 1986 before even the team had been able to run its Ford turbo in a race weekend. Thus the outfit was compromised almost before it had started to fight. But that was only part of the problem. Another major factor was that the Ford Cosworth V6 turbo was, against all expectations, not a good one. Not initially anyway. The engine arrived late, Ford missing its own deadline of being available by late 1985 (partly as time was wasted developing an in-line 4 unit which was subsequently abandoned after problems). And when it did arrive it was hamstrung by curious and extreme caution from Ford. Time for a quick history lesson. Remember that F1 in 1986 was rather different to now. Then it was in effect an engine formula, and if you didn't have the horses then you didn't have a hope. This especially applied to qualifying, where rip-snorting qualifying engines, good for only a few laps but capable of well over 1000 bhp, were de rigueur and perfected by the likes of Renault and Honda. Yet Ford it seemed didn't want to play, ignoring the overtures of Jones and others imploring the company to pursue power, indeed never even developing a bespoke engine for qualifying, and rather than prevail via grunt instead hoping to benefit from reliability just as the old DFV had. That never happened though, and the Ford-powered engines - fighting the last war - were simply blown away in qualifying and the races (rumour had it that the approach was in part based on Ford fearing that blow ups - risked in chasing power - would be bad for its PR). While waiting for the Ford to arrive the team had in its first few race meetings in late 1985 and early 1986 used Hart units instead. As Jones noted though that engine was 'a boy trying to do a man's job...it was a Formula Two engine turbocharged...it wasn't a case of if it blew up but when'. In spite of all of this though it had some worthwhile grunt, usually good enough for halfway up the grid in 1986's opening rounds. But while the Ford unit was much more reliable its lack of straightline speed was devastating. It usually meant that Tambay and Jones were slowest through the speed traps, somewhere towards the back of the pack more generally and seconds off the pace - several seconds off in qualifying. Jones many times likened Ford's unit that year to an endurance engine, and even after breaking the team's points duck in Austria in late summer after he'd finished fourth with Tambay fifth thanks mainly to attrition (both were two laps down) he let loose the barb that 'the thing could hardly make it up the hill'. But even if good finishes could in theory have been achieved via strong reliability they usually were not in practice, as if the engine was fairly reliable the rest of the car wasn't. A variety of niggly breakages often stopped the cars before the race's end. Nigel Roebuck noted that the series of problems 'were the consequence of lack of attention to detail, and, in some cases, poor preparation'. Quite why this was isn't clear. Some watching on noted that the challenge of 'gelling' the number of newly-recruited personnel at Team Haas was never going to be a small one. Others believed that the team, focussing as it had been on recruiting star names, had a too-many-chiefs-not-enough-Indians quality. Internal difficulties, with the equally abrasive Mayer and Jones rapidly descending into conflict, probably didn't help matters either. But whatever the case, the gutless engine, rarity of making the finish and lack of budget seemed to wear the whole operation down, and long before the year's end it seemed to be in a state of drift, almost counting down the days to the final race. Many thought that this applied to the drivers too, Jones in particular appearing to lose heart in the project at an early point of the season which was reflected in his driving. But then perhaps this was understandable: aged 40 and returning after four years of retirement Jones was looking for instant results, and it was clear pretty quickly he wasn't going to get them. 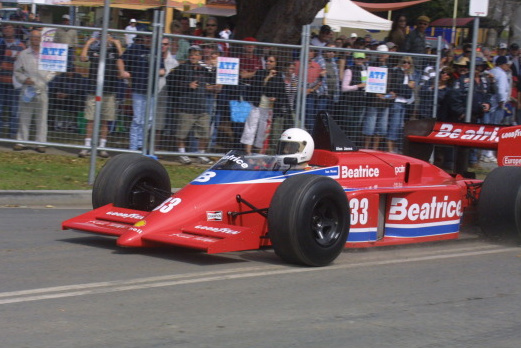 Indeed, when Eddie Cheever was brought in for one weekend only in Detroit replacing an injured Tambay he immediately left Jones far behind, and moreover qualified tenth and looked good for points before a typically niggly breakage put him out, as well as displayed a positive attitude to the car that was of much relief to Ford and to the team. So perhaps if Haas had recruited a driver or two with something to prove such as Cheever, rather than two ex-winners somewhat past their best, it would have helped matters a little. But given the other problems it would only have been by a little. And all of the maladies were a pity as amid it all the Oatley-Brawn chassis was a good one, probably one of the very best out there in 1986. Cheever described it as 'a jewel' and 'the best I've ever driven', and on circuits where top end power wasn't as vital (of which sadly for the team were much fewer in 1986 than now) the car looked much more competitive. Detroit we know about, at the Hungaroring the cars ran fourth and sixth early on before typical maddening problems knocked them back, and in qualifying at Spa Tambay was the quickest of everyone through Eau Rouge. It was one of the year's might-have-beens that Tambay actually qualified in tenth place there (without a qualifying spec engine as mentioned) only to be wiped out of the race in the chain reaction to a first corner shunt that he had nothing to do with. More broadly, it doesn't seem exaggeration to say that had F1 in 1986 been the chassis formula that the sport was to become Team Haas probably would have been taken much more seriously, perhaps would have challenged for podiums. What if Adrian Newey's first F1 car had been for Team Haas? 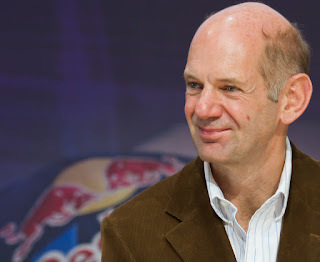 Mid-1986 one Adrian Newey, fresh from success in Indycar with his March design winning two championships, arrived in the team. But in the brief period available not even he could halt the slide. Long before the year was out it was clear that Ford despite its own shortcomings was exasperated and looking for a new team to provide its engines to, and Oatley was also due to leave for McLaren. Haas sought funds to keep the team going for 1987, but was unable to and by October had sold out to Bernie Ecclestone. Bernie wasn't inspired by benevolence however, instead he was seeking to plunder what he could from the remnants for his own Brabham squad, mainly the Ford engines (which he failed to do, the Ford units ultimately ending up on the back of the Benettons). Team Haas therefore was finished. And so it was the considerable talent that was at the team splintered. And doubly galling was the success they had elsewhere: Oatley at McLaren almost immediately helped create the most devastating car the sport would ever see in the MP4/4 for the 1988 season. Newey went back to March, this time to lead an F1 effort, and in 1988 his March 881, his first F1 design, represented a conspicuous forward step in what was possible in F1 aerodynamics, and of course subsequently he was to be the sport's design standard bearer at Williams, Red Bull and (to a slightly lesser extent) McLaren. And Brawn went off to Arrows, taking a number of ex-Haas engineers with him, from where he'd go, via the Jaguar sportscar team, to Benetton, then Ferrari and then to his own team in which time he would bag championship titles routinely. Indeed, ever since 1987 only five constructors' champion cars of the 26 did not have involvement by one of those three (I kid you not). Thus even allowing for F1's usual preponderance of 'what ifs', the case of Team Haas seems especially laden with them. What if money could have been found to continue? What if the technical brains who would go on to enjoy such success elsewhere could have been kept together? What if the dream ticket of Brawn and Newey had been allowed to design a Team Haas challenger for the 1987 year? What if Team Haas was the team that benefitted from the much-improved Ford turbo engine seen on the back of the Benetton in 1987, that even looked like toppling the mighty Honda by the season's end? The team had other problems to resolve of course, but it doesn't seem too outlandish that if those 'what ifs' had come together then recent F1 history could have looked very different. If nothing else, you'd imagine that Team Haas would have ended up being far from the Team Farce that F1 history tends to view it as.